There are already several fret calculators here and there around the Web. Automatic drawing of the set fingerboard-frets-nut-bridge-string in a realistic way, compliant with the technical drawing standards, and with a SVG output format, which is directly possible to import in CAD softwares (QCAD, AutoCad for instance). A front view (orthogonal in the FB plane), right view and left view, as well as a draft view that gives the fret placement. Calculation of the fair spacing of the strings on the nut and bridge, for all kinds of string configurations, taking into account the gauge of each string; the string number can be variable, single strings, double string courses, possibly different gauges for the strings of a same course. Drawing or not of a binding around the FB. Drawing or not of inlays, of different shapes and size, including on the edge of the FB. The exact layout of the string angle with respect to the FB plane, taking into account the wished action. Layout of the bridge, top plane and neckangle. It also works on fretless instruments like the violin. You just need to enter a null number of frets. The principle is simple, you only need to fill the form below with the parameters you wish, click OK and the drawing will immediatly appear on the screen. Then you just have to use the "Save as..." function of your browser, carefully selecting the SVG format. The output drawing is in the SVG format, but what can be done with an SVG file ? It can be opened in Inkscape. The SVG vectorial format is the native format in Inkscape. If you only wish to print the fret template, please see the tutorial here below for a 1:1 scale printout on several A4 sheets starting from Inkscape. Finally, the sketch can be imported in a CAD software and it can be the starting point for the complete drawing of an instrument (it is actually the reason why I created this software tool). This drawing can also be easily opened in a CAD software and can serve as a starting point for the full drawing of the complete instrument. This is a tool I have developed for my own needs, following an original idea from Christophe Grelier, and I am happy to share it with the luthery community. Please, leave me your comments and remarks as well as suggestions for any evolutions ! Help would be welcome to improve the set of preset instruments, fell free to send me data, I will add them to the list. You can comment at the bottom of the page, no need for subscription. How to print in full-size the fret template. If you don't wish to use a CAD software, it is possible to print in 1:1 full scale the fret template, on several pages with your simple home printer. You will be able to reassemble the sheets in order to use the template directly in the shop, glued on the wood. Fill in the form above with your data, and once you got your drawing, save it on your computer as an SVG file. In your Web browser, on the sketch, right click, "save as ...", and save the file with an SVG extension. The default name is "Fretboard by 4choeurs.svg". Install, if not already done, the free vectorial drawing software Inkscape. Inkscape, to date, doesn't manage properly the multi-page printout. 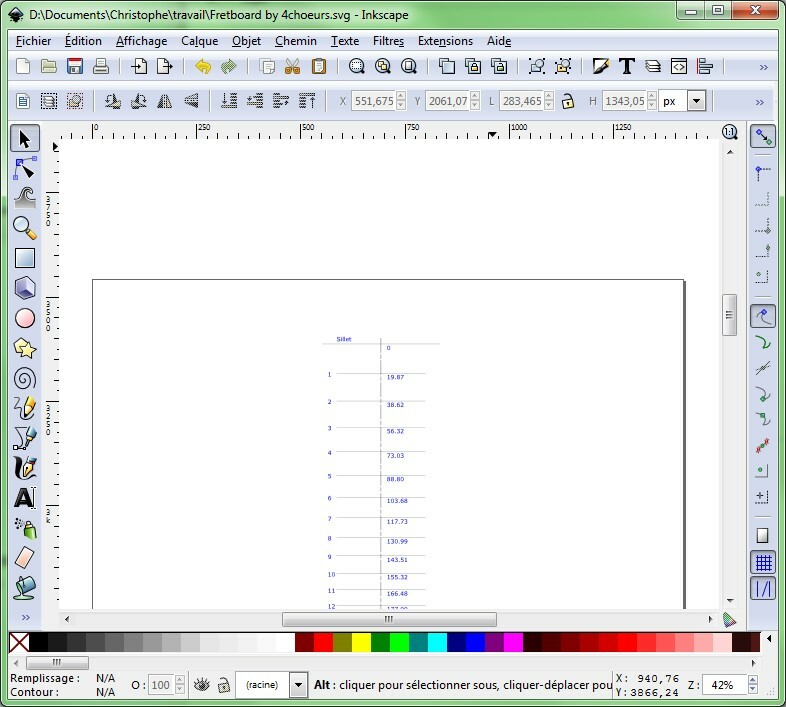 The tip is to use Inkscape to export the SVG drawing in pdf format. 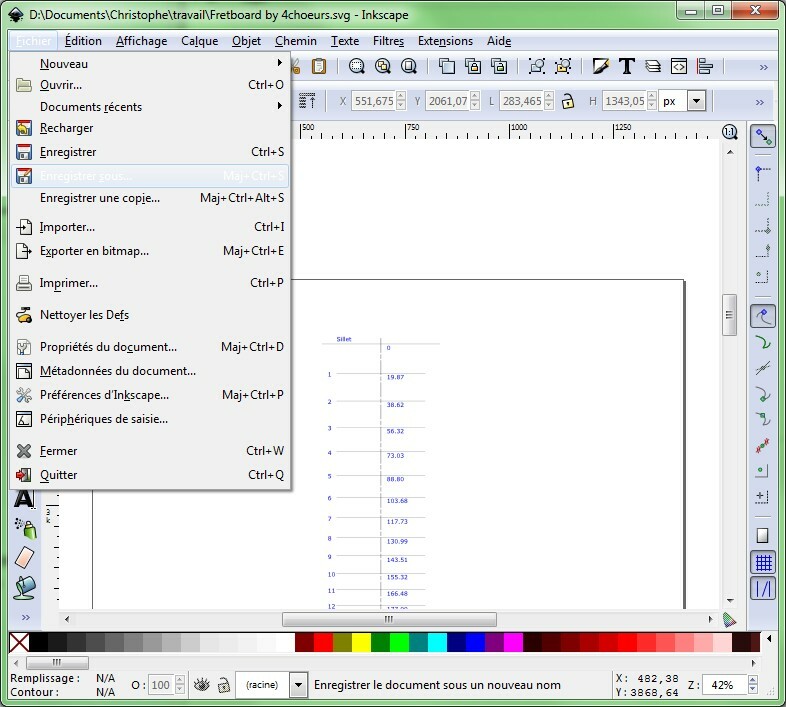 First, open your file in Inkscape. 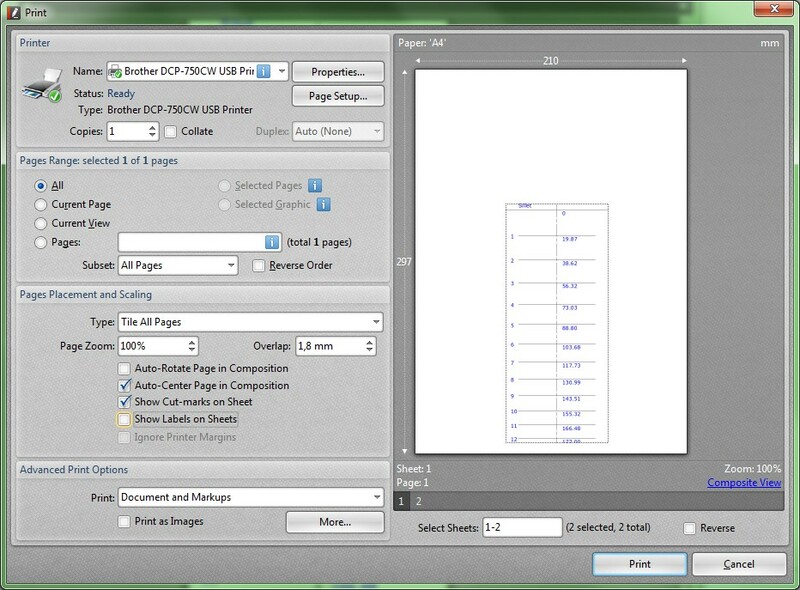 - Select the left part that you don't want to print, using a rectangular selection box. 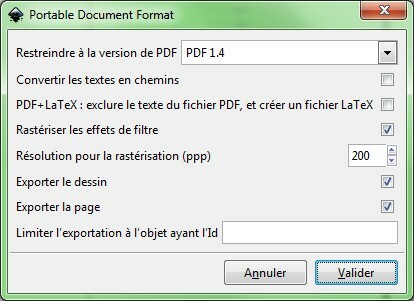 - File menu / Save as ... ==> Name the file, and in the Type field, choose "Portable Document format (*.pdf)"
There are several pdf readers that allow multi-page printouts, I propose to use one of the best, according to me, which is, PDF-XChange. It allows to print any document in multi-page, managing the overlay and printing cut-marks, which is mandatory for an accurate reassembly. You obtain this way several sheets, 1:1 scale, that you only have to re-assemble with scissors and tape, thanks to the cut-marks left in the corners of each sheet. The glue moistures a lot the paper, which will tend to expand and to distort, which may ruin the dimensional accuracy of the template. The tip is to apply the glue preferably on the wood, and then to apply the paper on the wood. I personally use gum Arabic, applied with a brush. This glue is thin, is very well spread on wood, and is easy to remove simply humidifying the paper with a sponge.